The air quality for your Toyota FJ Cruiser is a vital part of your vehicle’s performance. Quite often, it can lose efficiency and power thanks to dirty air filters. Or your cabin can stink. Here is how to change them. 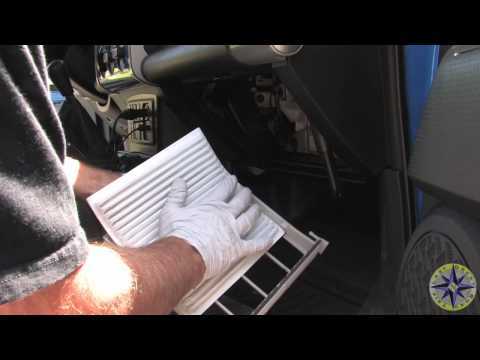 Changing the engine air filter is simple – just find these two clips. The Cabin Air Filter is a bit tougher. Toyota’s FJ Cruiser has several air filters and you will need to change them periodically. According to Toyota, you should change them every 36 months or 30,000 miles. In order to change them, you don’t really need any tools. You will just need to make sure you have the same size air filter that came with your FJ Cruiser and the knowledge of where they are. You can check with your local Toyota dealership for more information. You’re engine air filter is probably the easiest one to locate and the one most people know about. There will be two clips holding the air filter housing canister to the air filter housing. Pop those clips off and the canister will pop free. The air filter is located inside the canister and it is a simple swap from here. Then, put everything back together. First, this air filter is located behind your glove box. You will need to remove your glove box to get to it. In order to remove the glove box, you will find two “stoppers” that are along the hinge. Pop these stoppers in and then glove box will open and be easy to remove. With the glove box out of the way, there will be a white filter tray. Pull this out. Next, remove and replace the old filter inside the filter tray. Then, reverse these directions to put the glove box back in. Having a clean air filter means your engine will perform better. A new cabin air filter means your FJ will smell a lot better. Both of these things are important to really enjoying your FJ.